13-Aug-2006 -- The Confluence is situated in the Sengwa River basin, Lake Kariba. The basin is predominantly shallow and has numerous underwater obstacles in the form of drowned Mopani trees, which make navigation interesting. It is also very exposed to the wind from any direction and is prone to big swells. Our starting point for the visit was Chalala Harbour on the Bumi shoreline, down the Sibilobilo lagoon, out through the Chunga Gap, past Photo Corner and straight to the Confluence, a distance of about 41 km by boat. We had calm waters which made the trip easy but we had limited time at the Confluence as there was some weather moving in from the East. I was using my old Magellan GPS which isn't the most accurate and we spent about 15 minutes at the site moving around with the bass motor chasing the elusive zeroes within a 50 x 50 meter area. We did get them briefly at one stage but I wasn't quick enough with the camera. The proximity was confirmed with Stephan's Garmin. Our depth at the site was 11 meters and the lake is about 6 meters down at the moment, lower than usual at this time of the year. Although the inflows were good, ZESA (Zimbabwe Electricity Supply Authority) is relying heavily on Kariba HEP as there is a country-wide electricity crisis due to the virtual collapse of the thermal power plant at Hwange. As a result, little of the inflow has been retained. The Sengwa Basin is surrounded by the Omay Communal Lands and is rich in wildlife, particularly elephant, which can be seen on the Bumi shoreline and the islands en route. The actual Confluence is fairly featureless (a few mopani stumps), however, the route there is very scenic, passing though the islands that make up the outer bank of the Sibilobilo Lagoon. #2: West, down the length of the lake. 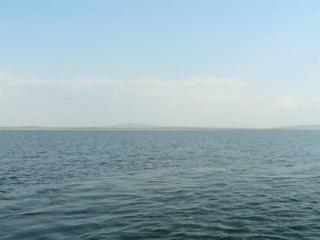 In the waters of the Lake Kariba, about 3 km from land.